The pond at Healing Waters Lodge is an major attraction for our guests to enjoy and for wildlife to thrive on. It is imperitive for us to keep the pond healthy and beautiful and that requires some maintenance. 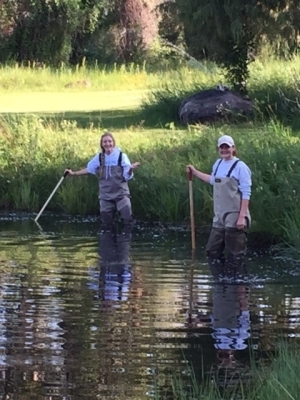 This morning, Erin and Mikayla are doing a great job mucking out the weeds in the pond. Then they will cut back vegetation in the spring creek to increase the speed of water flowing into the pond, bringing oxygen and better circulation to the pond.